Grafenrheinfeld. 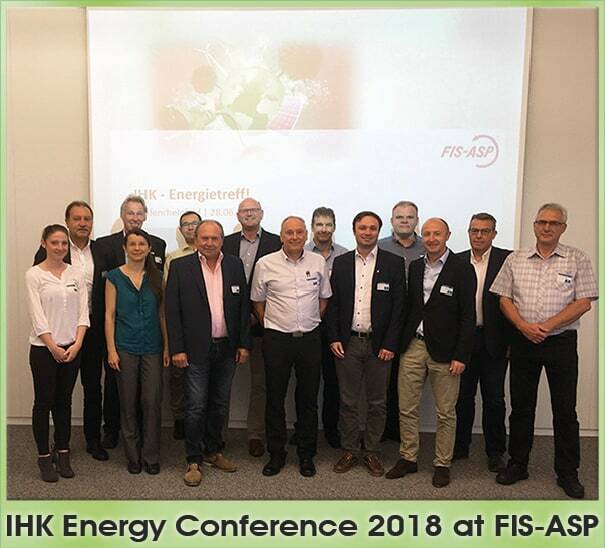 On June 28, 2018, the IHK Energietreff (CCI Energy Conference) took place at the headquarters of FIS-ASP Application Service Providing und IT-Outsourcing GmbH in Grafenrheinfeld. Founded in 1992 as a spin-off of FAG Kugelfischer, the FIS Group now employs around 650 people at its headquarters as well as in branch offices in Offenbach, Leonberg, Hamburg, Gliwice (PL) and Manchester (UK). In the technical wholesale sector, the FIS Group is the market leader in Germany, Austria and Switzerland. The topic of this year’s conference was efficiency measures in the area of data centers. The FIS-ASP data center consumes 2.8 gigawatts of energy p.a. at the Grafenrheinfeld location, which corresponds to the supply of around 800 households. FIS-ASP is therefore particularly interested in energy efficiency measures. The data center is operated with indirect free cooling; the housing is particularly energy-efficient. In addition, FIS-ASP feeds electricity generated by photovoltaics on an area of around 2,800 m² at its headquarters directly into the grid. The participants exchanged ideas intensively before and during the visit of the data center.